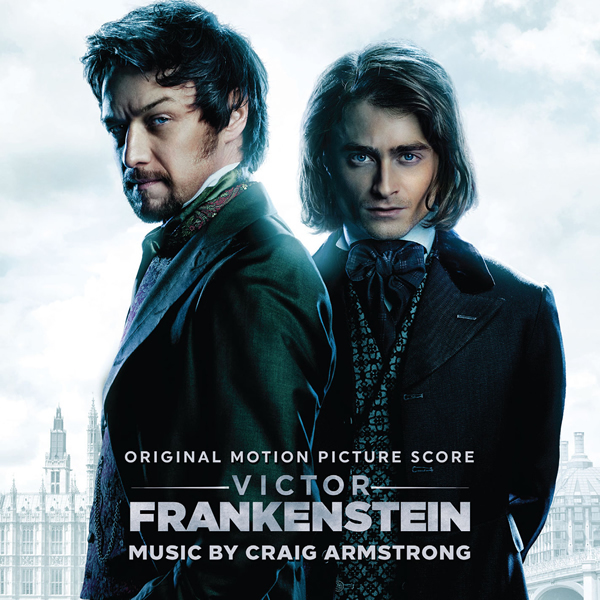 La-La Land Records, 20th Century Fox and Fox Music present the CD release of the original motion picture score to the feature film VICTOR FRANKENSTEIN, starring Daniel Radcliffe, James McAvoy, Jessica Brown Findlay, Andrew Scott and Freddie Fox. The film is directed by Paul McGuigan from a screen story and screenplay by Max Landis. The producer is John Davis. The film opens in theaters everywhere November 25. Acclaimed composer Craig Armstrong (FAR FROM THE MADDING CROWD, THE GREAT GATSBY, LOVE ACTUALLY, MOULIN ROUGE!) unleashes a powerhouse orchestral score to propel this dynamic and thrilling twist on a legendary tale, starring James McAvoy and Daniel Radcliffe. Radical scientist Victor Frankenstein (McAvoy) and his equally brilliant protégé Igor Strausman (Radcliffe) share a noble vision of aiding humanity through their groundbreaking research into immortality. But Victor’s experiments go too far, and his obsession has horrifying consequences. Only Igor can bring his friend back from the brink of madness and save him from his monstrous creation. Brimming with dramatic thrills and sweeping emotion, Armstrong’s score is a feast for the ears and one of the year’s most notable works. Produced by Craig Armstrong and mastered by Simon Francis at Simon Francis Mastering, this special CD soundtrack release is now available from La-La Land Records.